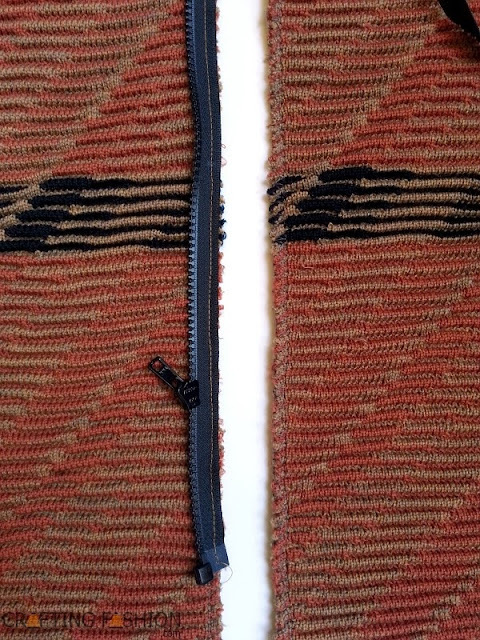 On the way to figuring out the best way of inserting an exposed separating zipper into my ripple jacquard sweater jacket-in-progress, I found two videos. 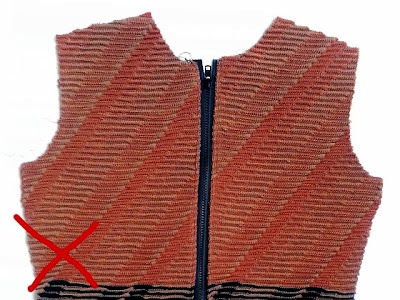 The first video with a demonstration by Gretchen Hirsch, taught me that what I had in mind isn't really an exposed zipper. It's more of a semi-exposed zipper. Nonetheless, I'm linking to this video because the zipper is awesome, and one day I'll insert a pretty, completely exposed zipper. But not today. 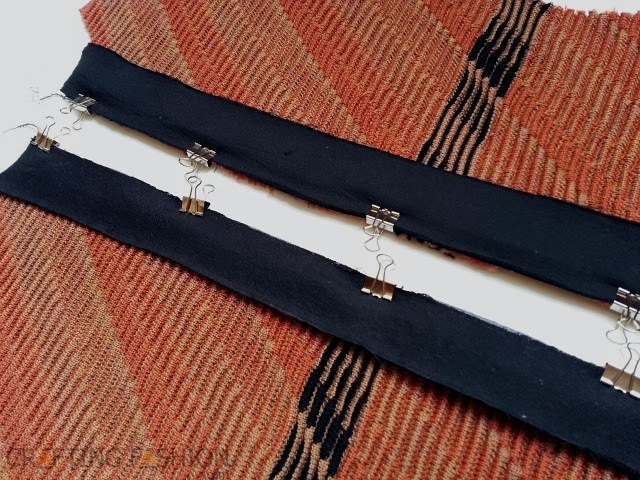 Because I'm using a facing on the front opening of the jacket and because I haven't been completely thrilled with any of the zipper insertion techniques in my book collection, I decided to base my zipper insertion on the technique in this video by Bari Ackerman. Yes, I realize Bari is making a bag and not a sweater and her zipper doesn't even separate, but it is semi-exposed and her "zipper sandwich" produces the look I want. Although I'm using much heavier fabrics, I thought I'd try a variation of this technique for my jacket and facing. I practiced my variation with scraps of main fabric, interfacing and facing, and a strip of heavy denim, standing in for the zipper. This fabric was much too textured for glue basting (sigh), but machine basting worked well. You can see my first steps in the pic above. First, I serged the raw front edge (right). The next step ( left) was to machine baste the zipper in place, right side of zipper to the right side of jacket. And when both sides were basted into place, I steamed and top stitched to finish. Problem is that I got ahead of myself and top stitched, forgetting to make the zipper sandwich with the facing!!!! I've now picked out the top stitching and used binder clips to hold facing (already interfaced) in place. You can't see it, but the zipper is sandwiched in there and I will hand baste it all together, before turning, steaming, and top stitching on the machine. In a future blog post I'll share the entire process in an orderly manner. The tutorial for Inserting a Separating Zipper in Thick Squishy Sweater Knit is now posted. This way I'll be sure to have a step by step guide to follow the next time I try this.